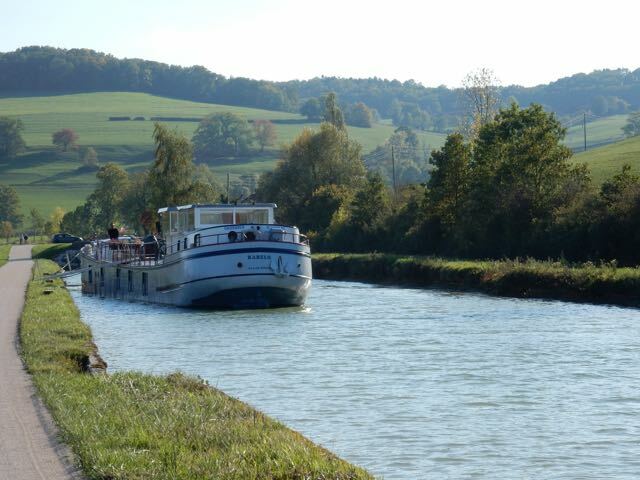 After six months of cruising we are almost at our winter mooring in Veneray les Laumes. Fall is in the air. The pastures have turned a thousand shades of green. The trees are loosing their leaves while painting the canal in a carpet of gold and red. It is so late in the season that our liquid highway is running low on water. In fact it is so low we aren’t sure we’ll make it all the way to Veneray. Rabelo’s bottom has been dredging a long furrow in the muddy bottom of the canal. There have been times when I’ve lost all steerage, and had to let the bow head in whatever direction it decided to go. At our last stop before Veneray we couldn’t even get Rabelo’s backend close enough to the shore to use a stern mooring line. Our last stop before reaching Veneray. 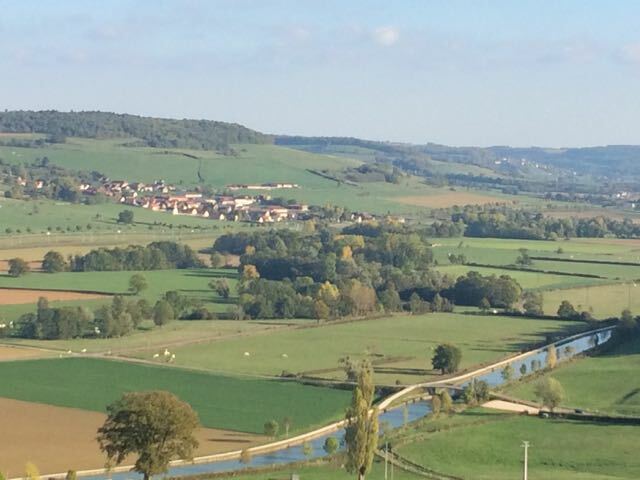 Note the Burgundy Canal in the foreground. We typically have one set of friends on Rabelo every month. We’re very relaxed about who comes when, and tell our guests to pick a five night period during any month that is still available. 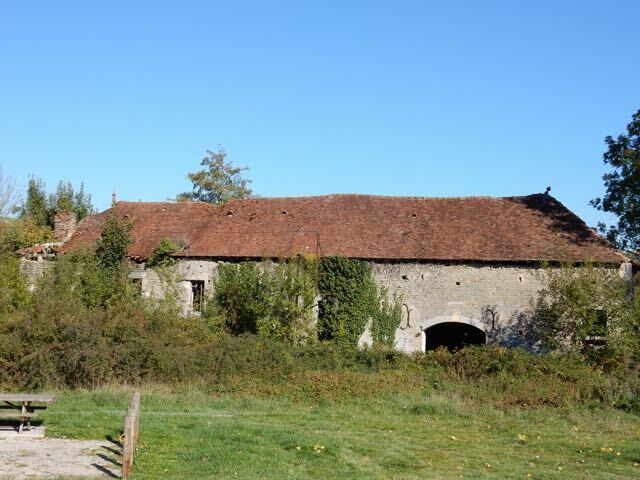 Lisa and I have discussed on numerous occasions the time of year we like most in France. We have pretty much settled on the end of October to the beginning of November. The weather can get a bit snotty, but all things considered it’s still our favorite. The tourists have all gone home, and even the hotel barges are being tidied up for the winter. 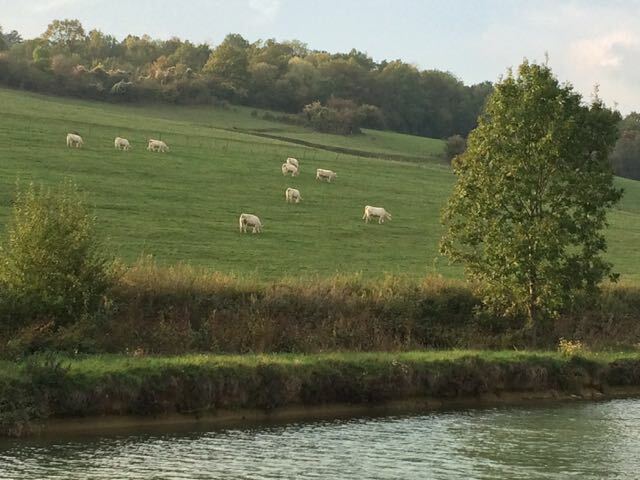 We pretty much have the French countryside to ourselves. 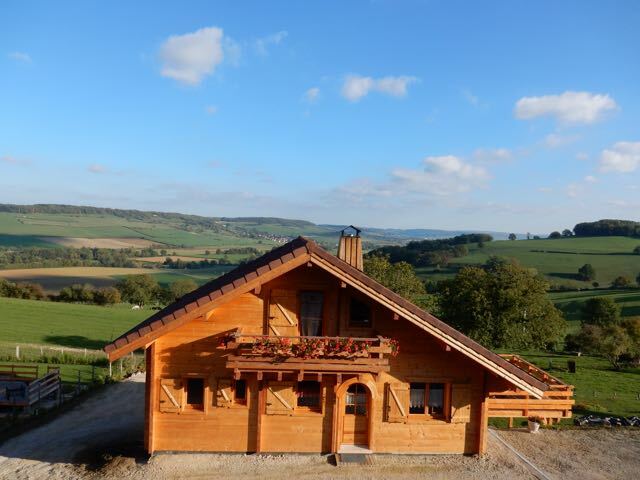 We love this unique French home with a view. The trees are starting to turn colors. A nice path along the canal. 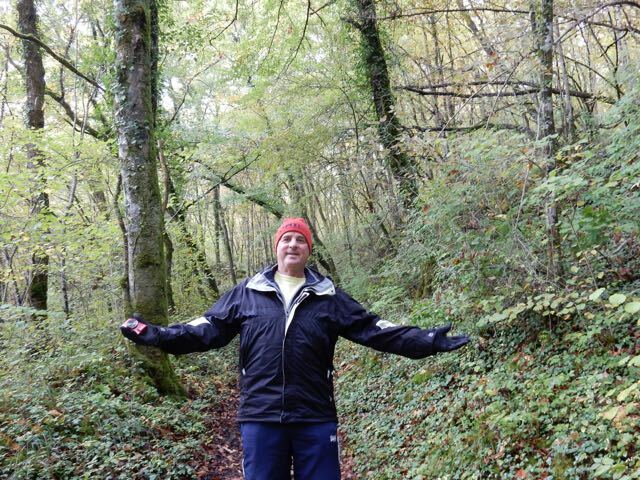 A nice walk in the forest. 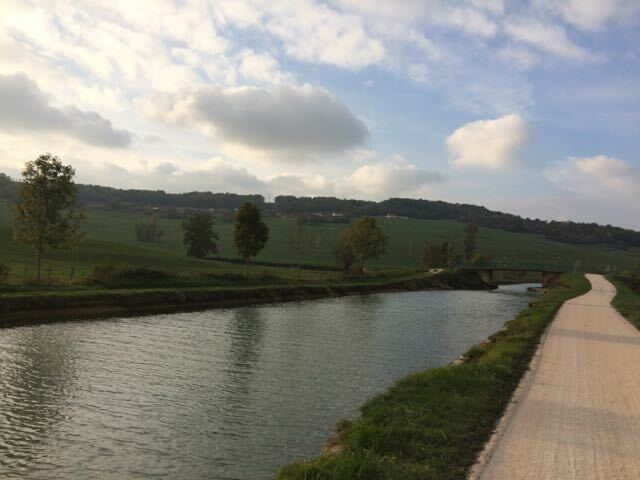 We especially enjoy our afternoon walks along the canal or up in to the forest covered hills. A camera becomes as important as our walking shoes. No matter where we are there are always villages to explore. 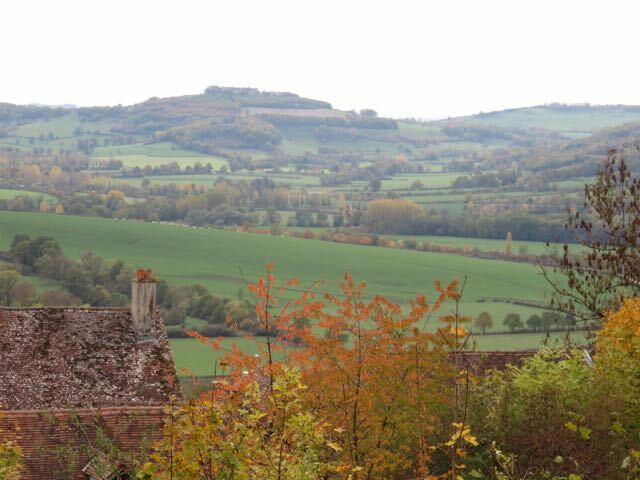 The vistas never cease to amaze us, and the villagers are always friendly. 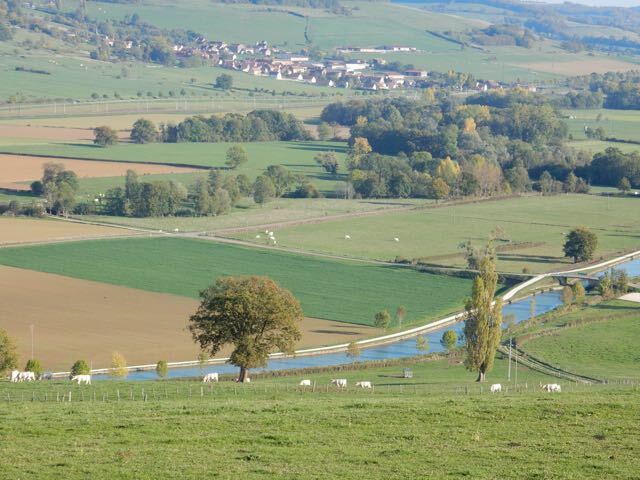 The Burgundy Canal runs through some beautiful countryside. Besides the white cows there were also white mushrooms in this pasture. 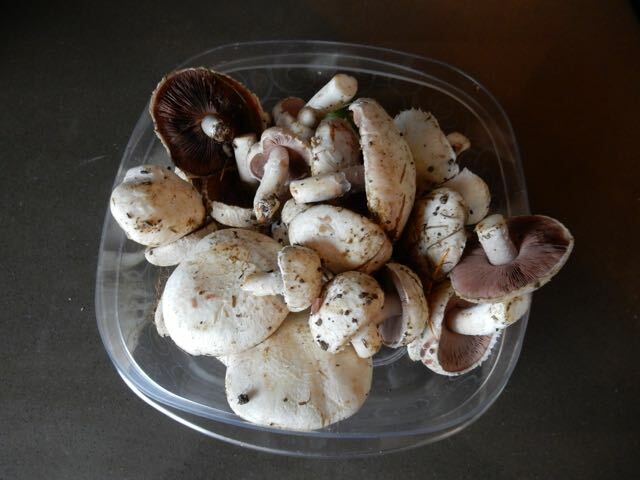 Lisa made a fresh mushroom salad. “Okay, but don’t take too long. Kevin ran down below to tell Lisa that she was going mushroom hunting. By the time I had Rabelo secured in the lock Lisa and Kevin were back on deck ready for another adventure. Kevin climbed ashore to help the lockmaster close the lock gates. Once the gates were closed Rabelo began to rise. When the deck was even with the top of the lock wall Lisa stepped off, and away they went never to be seen again. Well at least not for the next twenty minutes. Kevin and Lisa returned with a basket of fresh mushrooms, and smiles as wide as the canal spread across their faces.